Called Atlantic British and discussed. I am going to swap over the front cover and replace the timing chain while I am in there. That part you've identified in previous post is just a sandwich plate to route oil out through a cooler and back in again. The 3.9 with auto transmission has oil coolers for both transmission and engine built into each side of the radiator, which those lines go to and from. As you've found, it should be a straight swap for front covers as you need. Just check carefully all the components do match to make sure you've got no odd things going on regarding front pulley etc for seals and spacing. Not alot changed on them from each update apart from the later one that went to serpentine ancillary belt, so there's no real catches on your two I believe. Remember to pack the oil pump internally with petroleum jelly prior to install, it's needed to prime an empty oil system on start up. You'll also need a new gasket for it as you take the pump face off to pack it, it's just a very thin paper type. They usually tear when removed. Thanks for the validation. 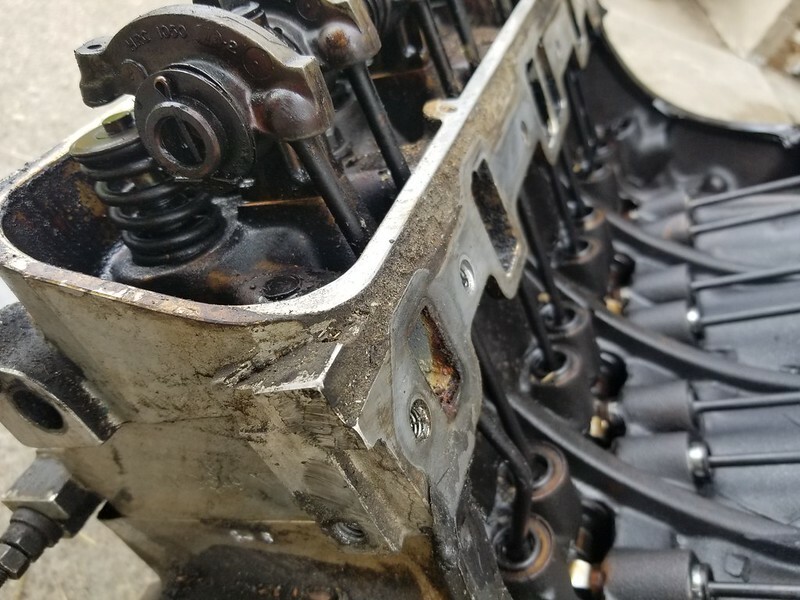 I have a full intake gasket set on the way, as well as exhaust gaskets, front cover gaskets, timing chain kit, oil pump gasket (looks square, believe the same you are referring to). 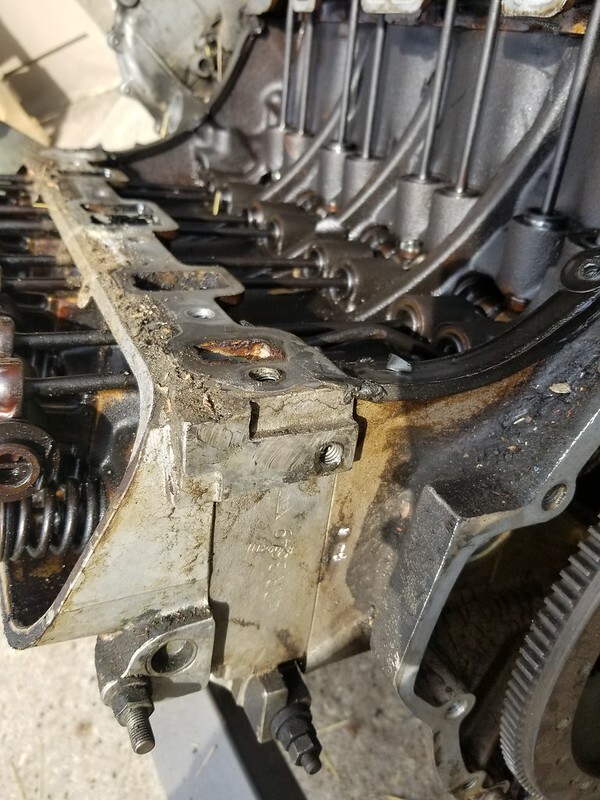 I found that the exhaust and mounts made it difficult to align the block with the trans, so figured best to remove them as well. Looks like I have some tidying up to do on the motor now before it goes in. now is the chance to clean the engine bay, I would power wash bay and dress frame. same with engine wash outside, degrease and reseal in the hopes that if a leak develops it may be easier to find on a clean engine. the oil cooler adaptor is held by the oil filter threads. remove filter, unbolt threads remove sandwich, reinstall treads. another option is to add the engine oil cooler, which in theory adds another point of failure. this adds the concern of lesser of two evils, cooler possible cleaner engine (to which degree? ), versus a possible point of failure and leaks at extra connectors, oil lines and oil cooler. thus in retrospect just switch over the covers. Good point. The new steering damper arrived yesterday so I should swap that out as well. Any opinion on whether to invest in an electric impact gun to try to zip off the crank pulley? Their obviously isn't much to hold the pulley in place now that both motors are in the garage. I may try using my two foot breaker bar but even attempting to hold the flywheel in place seems like it will be difficult by myself. My compressor is not very large so doubt an air impact gun would have enough power. with air impact it's all about the volume stored, not the pressure. all compressors build air to 150psi nominal but a 5 gallon unit will give you plenty of storage to loosen a bolt. I switched to ingersoll rand titanium from snap on, matco and cornwell. as a professional, I have purchased a few cordless impact tools thru the yrs. some were great when new but as they aged they became paper weight (I use them a lot), other left a lot to be desired out of the box, some were returned others donated, traded or sold. currently I have been using Ingersoll rand with great success for about 5 yrs (w7150 iq 1/2 inch). use a dab (not much) of blue loc tight on the crank bolt to keep it from becoming loose and the subsequent damage, (it happened to me, not fun). Great advice as always. 5 seconds with the w7150 on each bolt and they zipped right out. New water pump arrives today along with a new bolt kit and gaskets. The timing chain kit is also in garage with all the new gaskets for intake and front cover swap. Fingers crossed and I should have the motor ready to be dropped back in by the weekend. Trying to get it running again by my local Landy Day on April 28th. The 3.9 has an oil cooler which the 3.5 did not have. On the 3.9 it's just an adaptor plate sandwiched between the filter & the oil pump and can be removed. Or you can figure out how to install a cooler if you want one. I am feeling incredibly disheartened at the moment. 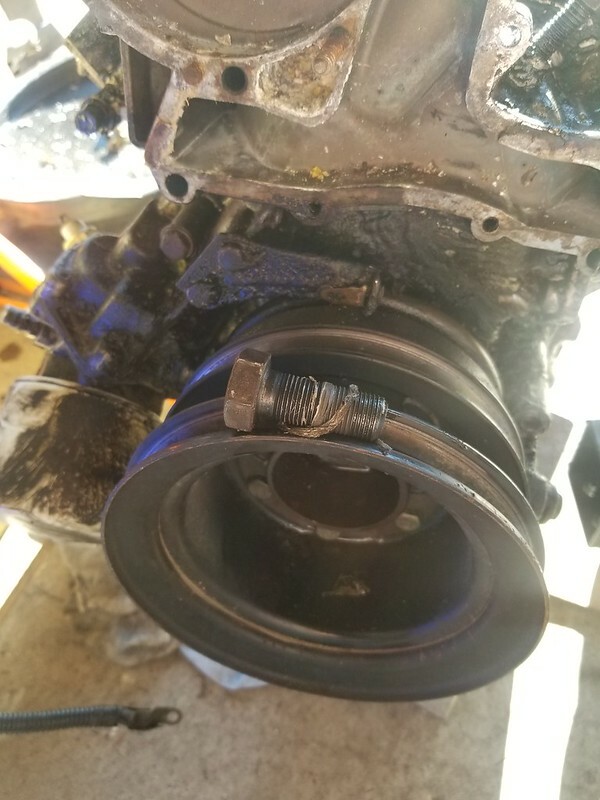 I pulled the intake off of the replacement 3.9 and found a bent pushrod. The valve still seems to seat so I don't think its bent, but not sure how I want to proceed now. Looks like it likely will not be ready for Landy Day after all. The Ebay seller included a warranty, but at this point I have removed all the mounts, manifolds, etc and even paid extra for shipping to my residential address. Worth requesting a refund, either full or partial? Here is the rocker and valve when seated. Maybe valve is ok? That's a difficult one. They'd normally bend more than one and with less distortion if cam timing is out. Have you put the cam timing onto alignment to see if it's been running off it's correct set point before you pull the gears and chain off? It looks pretty baggy, the chain, in the photo. I don't know if that's perspective of photo. Whether you go further into it and have more problems down the line, or back out now is difficult to answer. As regards getting it to an event, what's the cam gear tiiming chain etc like on your original 3.5? Did that have bent pushrods at all? 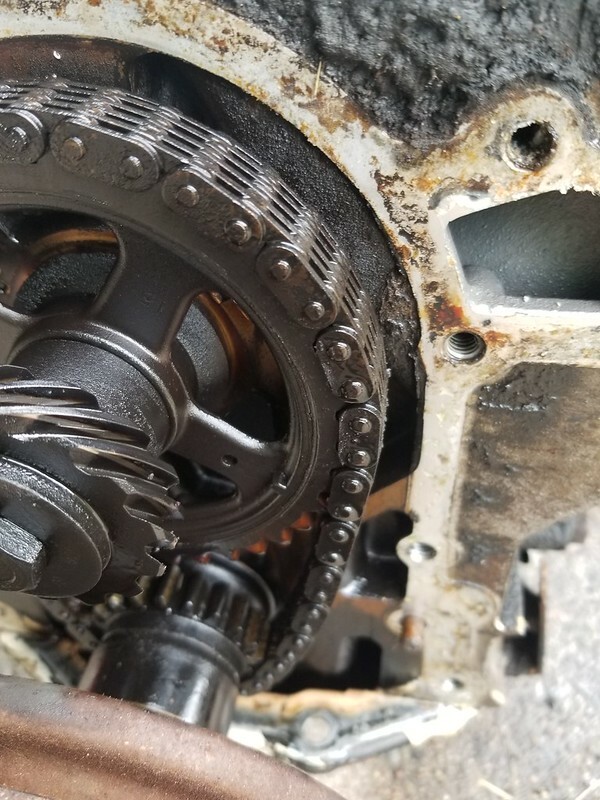 The cam chain on my 3.5 was very loose and valves made contact with the pistons on passenger side (think cyl 8 or 4, passenger side against firewall). I have a new timing chain and gear kit already. I also turned over the motor and the valve with bent pushrod does still operate. I had not pulled the cam chain assembly on the 3.9 yet either so will look back to make sure it didn't skip a tooth. the rover engine can be turner by starter while on bench (out of engine bay) this being said test for compression if all well I would replace push rod and move on, if it fails then I would read riot act on seller. For a compression test, would turning the crank using a bolt on crank pulley by hand suffice? I will check but maybe I can just use a lifter and pushrod from my 3.5 as long as they are within spec. For compression test, no to turning by hand. Remove all plugs, connect battery + to starter supply, battery - bolt to engine block, then use a small wire to starter solenoid trigger terminal to initiate cranking. WARNING, you really need oil pump and oil to turn it over much. I'd go along with 95classic on 3.9 motor. I had one that I was asked to wire to test run it on a chassis that had been in a fire. 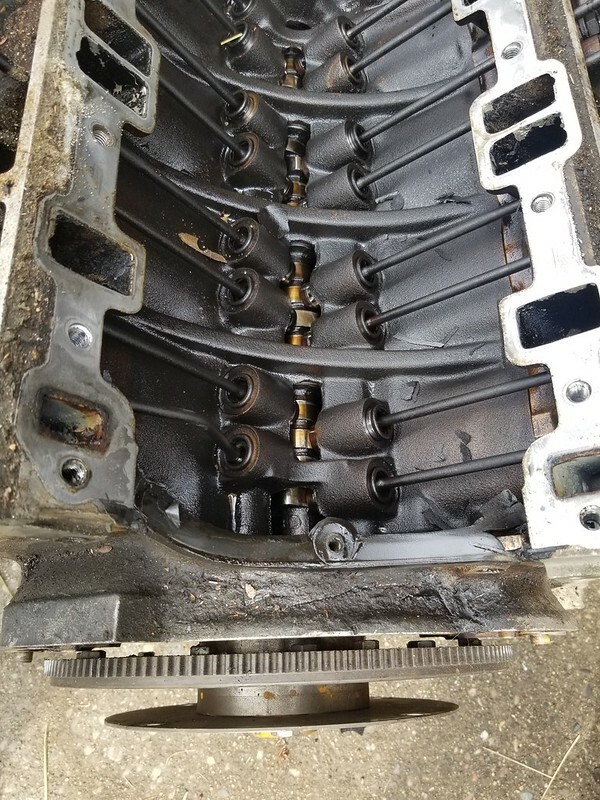 It had part melted the carbs, rocker covers and water pump. It was to assess it for transfer into another vehicle so we got it running. I advised to install new cam gears and chain which was ignored! A few months later it failed to start, ominously. They'd towed it up and down in gear to try to make it go, I checked distributor and no rotation. Stripped front cover and the cam gear teeth had become detached from core, causing absolute fail. Long story short, after replacing bent pushrods, and the broken drive, it fired of and ran without any problems. So no residual effects at all. Owner had it for another 5 years without any issues, so prognosis for yours should be ok.
Any signs of coolant in the cylinder with the bent pushrod? I had a 3.5L that had developed a head gasket leak and when it sat overnight, the cylinder must have filled up with coolant and when I tried to start it, it hydrolocked and resulted in a bent pushrod.